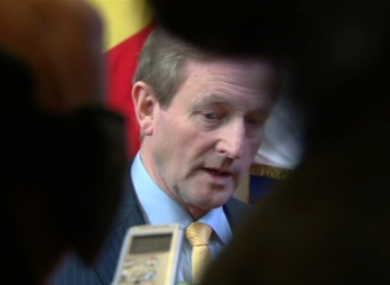 Enda Kenny speaks to Irish reporters at the conclusion of the two-day summit of EU leaders in Brussels. THE TAOISEACH has said it is possible for European leaders to agree on how much help Ireland can be given to relieve its banking debts, without needing the new EU-wide banking supervisor to be in place. Enda Kenny told reporters that discussions on Ireland’s unique financial circumstances, and how much of its banking costs Ireland could recoup from the new ESM bailout fund, would continue under Ireland’s presidency of the Council of the EU beginning next month. The comments came after finance ministers agreed earlier this week to make the ECB responsible for regulating 150 of the Eurozone’s biggest banks, in tandem with individual national central banks. This was a vital step in Ireland’s quest to recoup some of its losses from the ESM, as the ESM cannot take stakes in banks until the new multinational regulation system is put in place. However, finance ministers agreed that the new system would not actually kick in until March 2014 at the earliest – meaning any successful bid by Ireland to sell its bank shares to the ESM, and recoup some of the €64.1 billion it has thrown into the banking system, would be delayed until then. Kenny today said there was no reason why discussions on Ireland’s circumstances could not continue in the meantime, however. “It doesn’t have to wait until the conclusion of the discussions” on giving the ECB its new powers, he said. It doesn’t have to wait until the supervisory mechanism is in operation too. These things can proceed in parallel. We will work to see that that becomes a reality as soon as possible. Kenny said there had been a “quiet air of optimism” at this week’s summit, coming only days after the EU was formally awarded the Nobel prize, after finance ministers struck a deal on bank supervision, and with Greece having agreed a debt deal to shave €20 billion off its national debt. Email “Deal on Irish bank debt 'can be reached before 2014' - Kenny”. Feedback on “Deal on Irish bank debt 'can be reached before 2014' - Kenny”.